Not every website offers a full screen mode for its contents like YouTube does. If you visit the popular video hosting website, you get an option to watch videos in full screen on the site. While select sites offer that as well, Vimeo or Dailymotion do for example, others do not. This is especially true for the majority of gaming sites out there, but video sites too do not always offer full screen experiences. All browsers support full screen modes but this displays the entire website or service in the mode. It is clear that it is difficult to make sure games run properly in full screen mode due to scaling issues, while it is a lot easier to make sure that videos play in the mode. Running videos or games in full screen mode may provide you with benefits. First, it puts the focus on the content that matters. Not only will it be displayed in a larger area on the screen, it will also take care of other elements displayed on the sites hosting the contents. So, instead of seeing user comments, recommendations, ads or other elements, you only see what you are interested in. The full screen mode may also improve the experience that you have, or improve visibility. Fullscreen Anything for Google Chrome is one of the easiest options in that regard. The extension adds a single icon to Chrome's address bar that you can click to move contents to full screen. You can alternatively use Ctrl-Space for the same effect. It is not really clear how it handles that. The most likely explanation is that it scans for media contents on the site it is activated on, e.g. an image, Flash video or game, to display it solely on the screen. This works well most of the time, but not in all cases. I had success on sites such as Kongregate, Armorgames, YouTube, or Imgur. You are probably wondering what is happening if you try to invoke the functionality on a page with multiple elements on it. If that is the case, Fullscreen Anything will highlight them all on that page, so that you can click on the element that you want to run in full screen mode. Another click on the extension icon or use of the hotkey will return to the original page immediately. While the extension did a good job at finding the right media, full screen mode was not always that "full" after all. While it removed all side elements from all pages most of the time, it usually meant that black bars were added to the page in the process, likely to retain the aspect ratio of the game or video. So, it is more of an adjustment to fit the browser width or height more than it is a "real" full screen mode, most of the time. While you can work around that issue by changing the size of the browser window, it may mean that you won't run the browser window itself in full screen mode anymore. That's however only an issue if you want that. If you just want to play games or view videos without distractions and larger, then this should not matter at all. I did not really ran into any issues using the extension for Chrome. Occasionally, an ad would still be displayed but that is about it. I do not really think that the extension is that useful for images, as you can use the zoom functionality of the browser usually to enlarge them as well, but for games -- and maybe videos --, it is excellent. Alternatives: SwiftOut for Google Chrome. Designed with games in mind. 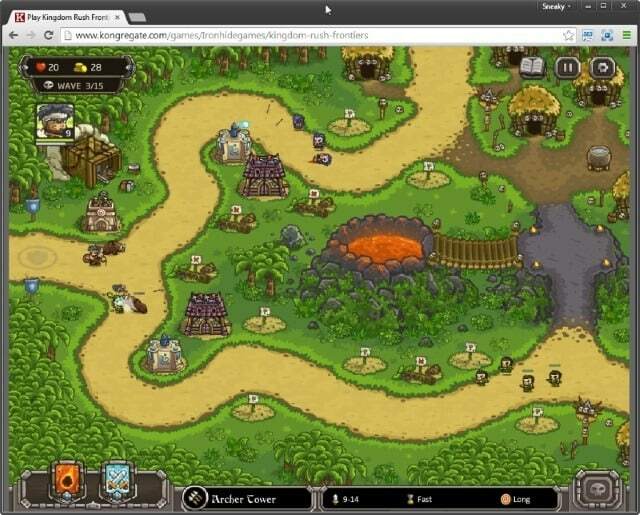 Firefox users can check out Flash Game Maximizer. Google Chrome is growing because many of Google features are available only on Google Chrome. Firefox ix still my primary browser and Chrome is secondary. However this extension is awesome. If the game/site you’re using has scalable elements, then zooming in/out will practically do the same thing. CTRL+ to zoom in, CTRL – to zoom out and CTRL 0 to reset. **note each zoom in step is fixed at 110, 125, 150, 175, 200, 250, 300, 400 and 500 percent, zoom out is fixed at 90, 75, 67, 50, 33 and 25 percent. The app only zooms in the active element and repositions everything else with a script unless it is locked then the screen gets jumbled instead.